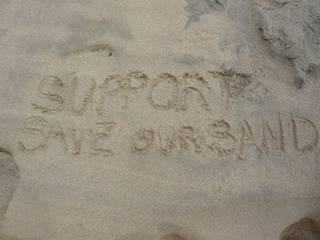 The SOS Hayle, St Ives Bay Web Site has been revived in urgent response to the current catastrophic and critical state of Hayle Beach and Dune System. sadness of those who loved her, passed away, a victim of man-made erosion initiated by commercial dredging. All that remains of her magnificent former state is a rapidly retreating Dune; decades of growth of precious Marram Grass and Sea Buckthorn which were integral to holding her together now tumbles down its slopes into the sea. The beach has gone, but if the Dunes retreat is not arrested urgently the consequences will be dire. (See Death Notice published in the Cornishman 24/02/11). Hayle Beach, located in magnificent St Ives Bay, towards the South West tip of Cornwall, is widely regarded as one of the most beautiful beach and dune systems in the world. However in recent times, as a direct result of the permanent removal of sand by commercial dredging, a significant section of the beach and dune have been reduced to a dying state. 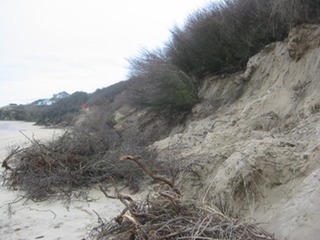 Due to accelerated erosion a vital dune system is in rapid retreat and a once magnificent beach reduced to a form of tidal flat.